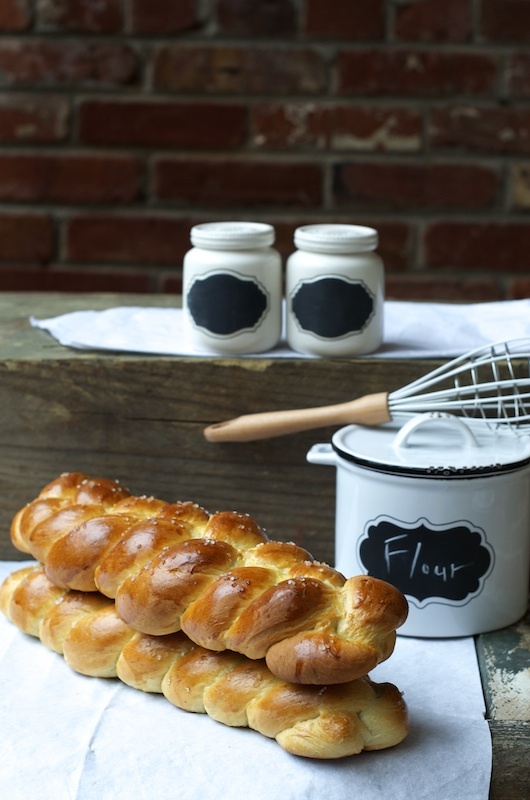 Finnish Pulla is very similar to challah, only fragrant with a warmth of spices. I find it intriguing how Scandinavians pull cardamon, a spice native to India, into their bread baking. Just like the tradition of baking cookies around the holidays, I love the Christmas bread baking tradition. I am mesmerized by cookies, but I have written about my frustrations with these crumbly, buttery treats in my Meyer Lemon Butter Cookie Sandwiches with Jam post. At least with yeasted breads I feel right at home. Unlike the cookies, I don't need to find a rhythm, I immediately get into the bread baking zone. I meant to tackle Stollen, Panettone, Swedish Tea Ring and Finnish Pulla for a number of years now, so when I saw this recipe on Red Star Yeast's website, I couldn't resist making it my next baking project. Scandinavians not only use cardamon in their breads, but also in mulled wine, cookies, cakes, pastries and meatballs too. According to National Geographic's Edible: an illustrated guide to the world's food plants and other sources, the cardamon, the second most expensive spice after saffron, or sometimes considered the third most expensive after certain vanilla beans, is a part of the ginger family. Indigenous to South India, and according to some accounts to Sri Lanka, Bhutan and Nepal as well, it was brought to Scandinavia by the Vikings, a thousand years ago, from their travels to Turkey. Cardamon appears in written Nordic cookbooks as early as 1300AD. Some believe the Dutch brought cardamon back to Scandinavia from their expeditions to south east Asia in the 16th century. Today, the largest cardamon grower and exporter is Guatemala, with India right behind it. Cardamon was introduced to Guatemala in 1914 and is referred to in The Guatemala Times article as "the green gold." This Holiday season I featured the Swedish Tea Ring and this Finnish Pulla. Please feel free to link up, in the comment section, all your Scandinavian baking this season. Happy Holidays to you all! This bread is a part of my professional collaboration with Red Star Yeast. Combine 2 1/2 cups flour, yeast, sugar, salt and cardamon, mix well in a mixer bowl with a hook attachment. In a saucepan, heat milk, eater and butter until warm (120-130F), butter does not need to melt). Add to flour mixture. Add 2 eggs. Blend at a low speed until moistened, then beat for 3 minutes at a medium speed. Gradually add the remaining flour and knead on low speed until a soft dough is reached, approximately 5-8 minutes. You might not need to add the remaining flour. Place dough in a lightly oiled bowl and turn to grease top. Cover and let rise for an hour or until dough doubles. Punch down dough. Divide into 3 parts. Divide each third into 3 pieces. On a lightly floured surface, roll each piece to a 16 inch rope. On a parchment line cookie sheet, loosely braid 3 braids. Pinch ends and tuck under. Let rise in a warm place for an hour or until dough doubles. Brush with the whisked egg, sprinkle with pearl sugar and bake in a preheated 350F oven for 20-25 minutes or until golden brown. Remove from cookie sheet and let cool. Wonderful! That is a speciality I really love. So fragrant. Seeing that I love challah, I know I'll just adore this. TY Linda. When I saw the recipe, my mind was racing with thoughts of all the angles I can pull into this post. Merry Christmas. TY Yaelian, appreciate it especiallycoming from a Finn. :) I was wondering does your site come with an English or Hebrew translation? Looks so lovely, I can imagine that cardamon smell.. Such pretty pictures Shulie. 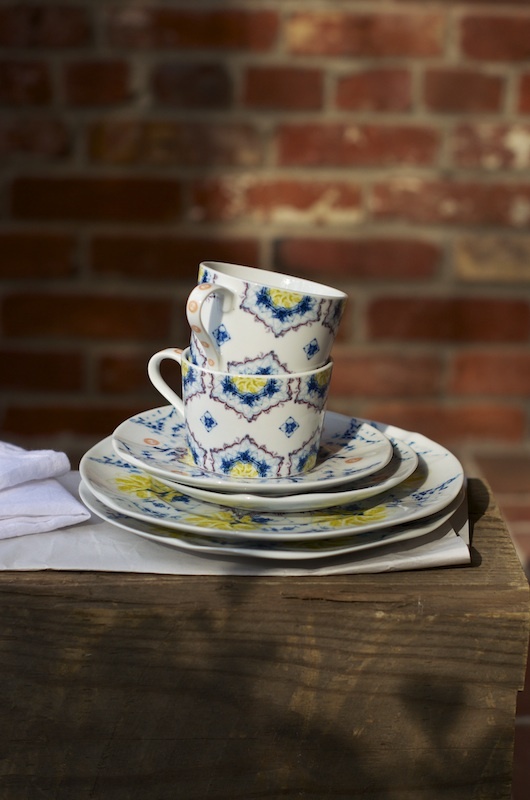 I am in love with that cup and saucer. Looks so Meditteranean. The pulla looks so perfect. It has got the perfect coloring. Great that you added cardamons. Your photos and your bread are both gorgeous!! Beautiful presentation! 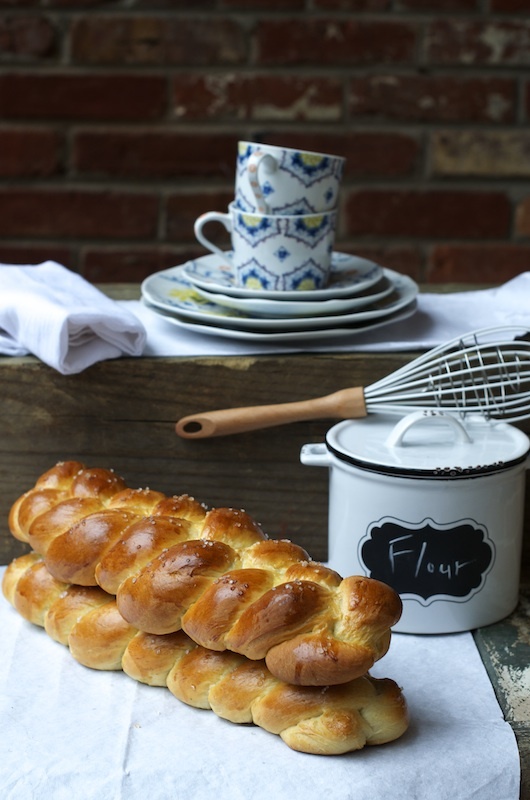 I love challah so I know I'd love this bread - gorgeous! I fell in love when you said cardamom. Divine!! זה משהו שאני פשוט חייבת לנסות, ואני חושבת שאלה החלות של סוף שבוע הזה. Winnie, כן זו ממש חלה בול. תוספת ההל פשוט מדהימה. כמובן שאני יודעת שזו ההתמחות שלך. אני ממש אוהבת את האתר שלך. All your bread post are so perfect and I love how neatly you always shape the breads. 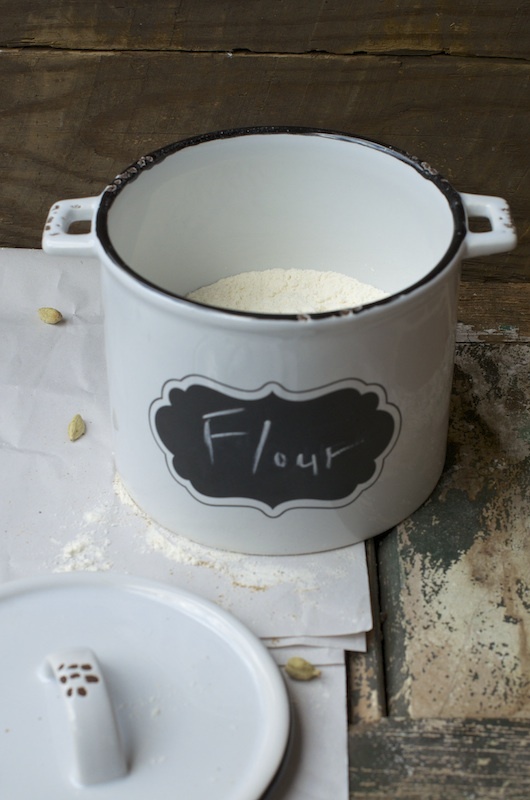 And those props .. gosh .. LOVE that flour pot/container! TY Terra. Yay for you loving cardamon. Beware of recipes that call for too much. 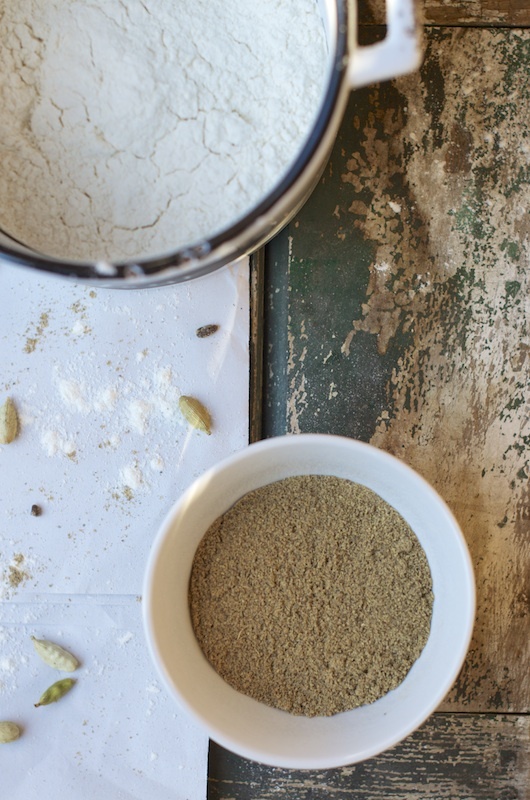 Saw recipes with 1 tablespoon cardamon for less flour. That is a no no. I was even weary at 1 teaspoon but it worked well with 7 cups of flour. Just in general even in savory recipes, use cardamon in moderation. ahahah I was like so cool Lora's mom dropped me a note and even said lol. :) Merry Christmas, Lora. I can totally see why is this bread a Christmas favorite, worldwide. Thank you so much everyone for your kind words. I am so happy to get into the Christmas baking spirit and discover new recipes, even if we don't celebrate. I do wish you all who do a Merry Christmas! You always make the most beautiful breads! Oh and I like those chalkboard jars you have, very cute. I always love the simplicity yet wonderful big flavor of cardamom in the Scandinavian/Nordic breads. I've wanted to make a pulla for quite sometime but always end up making Swedish kanelebullar ;o) I wish I could come over for a piece, a cup and a chat with you! I have never got a beautiful crust like yours in any of my bakes, Shulie..the loaf looks gorgeous! Sanjeeta, do not despair. I find only an egg wash achieves these results. I do not add milk, oil, water to the egg. That is my personal preference. Another breathtaking group of photos! Your yeast creations are incredible...perfect pulla!!! I just made these as gifts and they're gorgeous! I've only recently started baking bread regularly. I've had a terrible time with yeasted breads in the past so what better way to improve than to start baking bread regularly. I'm so intrigued by this lovely braided loaf! The warmth of the spices sounds so inviting. I've bookmarked this and cannot wait to bake it! Simply lovely.